SOLD $364,900 BUILT NEW IN 2008! Bedrooms: 3 "MAIN FLOOR MASTER WITH WALKOUT"
Bathrooms: 2 "2 PIECE AND 4 PIECE"
Garage: Single, Detached "2 INSULATED GARAGES, OVERSIZE SINGLE AND 24 X 30 DOUBLE"
Size: 0 sq. ft. "GREAT FLOOR PLAN!" Lot Size: 1.37acres 219.8ft x 231.06ft "200 FEET WATER FRONTAGE"
Year Built: 2008 "BRIGHT OPEN CONCEPT MAIN FLOOR"
Do you love the Great outdoors? 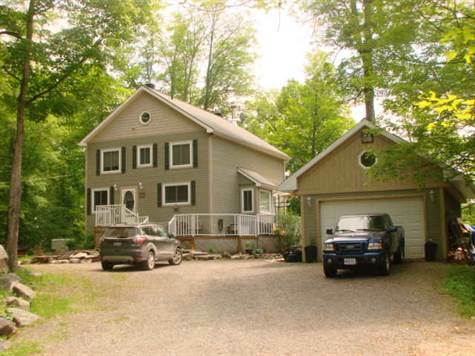 This newer 3 bedroom, 2 bath waterfront home/cottage/retreat will bring you closer to nature! Features of note include: A Bright & Spacious open concept main floor; a main floor master bedroom with skylights, beautiful view & walkout to deck and pool; soaring ceilings over living and dining rooms; 2nd floor loft with 2 bedrooms and full bath; A very nice well equipped kitchen; a main floor laundry room; 2 Walkouts to the wrap around deck & newer pool and a fabulous view; Nicely landscaped south facing yard; 2 insulated garages... an over sized single garage with storage loft plus a second brand new 24 x 30 double garage(siding to be completed before closing); an outbuilding that could be a bunkie or extra storage shed. The home is heated by a new recently installed forced air propane furnace complete with new ducts throughout and high efficiency wood stove. This a beautiful property with many new features! It's a great chance to live by the water at a very reasonable price. The property fronts on Raycroft creek which is navigable and flows into White Lake. A newer boat dock is included. A Public boat launch is located conveniently across the road. Boating fishing, hunting and year round outdoor sports, its all here, all within an hour to Ottawa! 45 Minutes to Kanata... 30 Minutes to Arnprior, Renfrew and Almonte.